Nonetheless the material covered in this classroom will never be taught of or thought of in the average electrolysis school normally you would only encounter this experience in the field. As the years pass by electronic technology doubles and triples and on the other hand after having visited electrolysis offices here and there I have discovered as usual there is always room for improvement. Into the bargain, if you office is an older building and you are not sure about the wiring hire an electrician to approve it or replace it. If your epilator is not plugged into a voltage line regulator it’s about time that purchase one as soon as possible! Most electrologists are never taught nor do they learn that “Dirty Electricity” accounts for the destruction of more epilators than one could imagine. Most people think well the buildings brand new and so is the wiring. That wiring might be new but most builders put the minim requirement in for commercial buildings. However, the local power company cannot guarantee that a consistent twelve-volts will come out of the line. That’s why it’s called “Dirty Electricity” because it fluctuates and during peak power demands this will damage all epilators computerized or not. Even during average electrical consumption with no peak demands it fluctuates up and down. Starting with the basics before you plug that epilator into the outlet make sure that it is a grounded three-pronged receptacle with no loose wiring or shorts. I have seen more electrologists in older buildings plug in a brand new Computerized Epilator only to short it out and damage it. Would you plug you Macintosh or PC into an untested outlet without a surge protector? In addition, you local hardware store will sell you a line tester for two or three dollars. This little three-pong wonder will tell you if the line is safe or unsafe. The cost of two or three dollars will save you a lot of heartache and frustration and money by the fact you will not fry you epilator or some other valuable piece of equipment. So test those lines before you plug in your epilator or anything else. All epilators whether computerized or not should be connected into a dedicated line. By doing this you will be assured of a steady uninterrupted flow of current with minimal fluctuations that allows your epilator to perform at factory design specifications. Quite a few people worry about the surge that their computerized epilator will get fried or should say burnt out. A lot of electrologists stick with their old transistorized equipment because they still have not taken that leap of faith forward or they think older equipment stands up better to current irregularities. Not true and it is unconscionable to foist an epilator upon the public whose current has been compromised by surges and brown outs. Please, spend the time to research the voltage line regulator and a decent surge protector. You say, “What is the difference between a surge protector and voltage line regulator?” The surge protector only does one thing it protects you equipment from an overpowering charge which if strong enough it will your epilator. In addition, a surge protector is quite inexpensive say thirty or forty dollars for a good one to protect your equipment. There is no way that any electrologist who uses a computerized epilator can say well that’s too expensive! Warning do not plug that computerized epilator until you finished this course to do so could most likely cost you an extensive, expensive time consuming repair. Next to your computerized epilator the voltage line regulator is the most important piece of equipment you can purchase and by doing so it will save you time, money, frustration and rage. Surge protectors are okay but they will not regulate the current on that line. The current that will cause damage to a computerized epilator is not the surge! The computerized epilator biggest enemy happens year round and more in the summer with the brownouts and low voltage that is constantly fluctuating and dropping the actual current below 12 volts to 11.5, 11.1, 10.9 or lower over a period of time will permanently damage the computerized epilator. Having personally observed electrologists who purchase a new computerized epilator and after they unpack it they want set it up right away and they do not notice that the manufacturer recommends that you buy a voltage line regulator. After three months the electrologists say, “There’s is no problem it’s a brand new machine and its cover under warranty, why get it?” Wrong, the damage caused by the current constantly going up and down during regular and peak periods is permanent. In addition, that epilator that you have been working with for three months without a voltage line regulator is already damaged from the first minute you plugged it in. The day you equipment crashes and you call the manufacturer they instruct you to ship it back to the factory. A few days later you get a phone call from the factory and they say, “This is not covered because it’s not from defective parts or workmanship and we will have to you charge accordingly.” All this happens because did not finish reading the directions or ignored the manufacturer where they suggested that you purchase a voltage line regulator and not to plug in the epilator on line with heavy appliances. Most electrolysis equipment manufacturing companies do not tell you that you need a voltage line regulator. So instead of learning this lesson the hard way you now have the option of a little preventative care which will save you time and money. In addition, you will not inconvenience your patients who need treatment that will go to another electrologist if you do not have a backup epilator. A lot of electrologists will say the old equipment or recently purchased non-computerized electrolysis epilator does not need a voltage line regulator. Wrong, think about this have you ever noticed with older or non-computerized epilator the patient will remark, “That was an easy treatment, I could hardly feel the current.” Or has a patient ever remarked, “That current is hot, did you turn it up?” If I you do not have voltage regulator with a meter and self-testing computer that verifies that everything is working just fine that’s your warning to stop the treatment and check the cord and all connections are in good working before resuming treatment. If you patient remarks one way or the other and you don’t have a voltage regulator you’re not providing the best treatment possible. Fact, because you chose not have a voltage line regulator you deny your patient the best possible treatment! A voltage regulator is designed to maintain the current to near perfection and by having one you can be assured that your equipment is operating at the factory recommended specifications or better. With no current fluctuations this in turn allows you the electrologist to render the best possible treatment for your patient! Let’s set the record straight whether or not you have computerized equipment or not you must have the following. A dedicated line with no other electrical appliance attached on it. You ask what is dedicated line? A dedicated line comes straight to power source in your office and the only appliance that plugs into that line is your surge protector and voltage line regulator. From there you plug in your epilator and you back up epilator that is never turned on unless you are doing doubles. A voltage line regulator constantly adjusts the current to the epilator while you are working. A voltage line regulator is accurate and maintains the electricity to with 1/100th of second or less during operation and keeps the current to the epilator at optimum factory recommended specifications while working on your patient. In the application of electrolysis every little detail counts and when the source of electricity is that accurate it’s little details like this that improves patients comfort the treatment. Low-voltage will under treat the hair and high-voltage is uncomfortable and compromises the patients treatment. In addition, when you equipment is running below par so is your patients’ treatment so I advise all electrologists to upgrade and at the minimum is to have a grounded three-prong outlet from dedicated line, voltage line regulator and surge protector. So this will be a complete course one needs be cautious when going shopping and they offer you a back up battery that is more expensive that will run a computer or computerized epilator for twenty minutes to a half hour in the case of power loss. Fact, to make it short I tried one nevertheless the batteries dissipate over a period of time and eventually cause more fluctuations of current that damages you equipment. On the other hand they are great for computers or printers but please do not plug your computerized epilator because the current from a battery is not dependable enough to operate you epilator. Static charges fry more computers and the worst charge come from an electrical storm you must explain to your patient that if the storm gets to close you have shut it off or the storm will fry you computer. Next on the list is the static charge that happens indoors due to certain atmospheric conditions and even friction from just walking on the carpet. Static charges happen and they are more frequent in the winter with dry polar cold snaps or dry desert air. Static charges can be prevented with a room moisturizer, anti-static spray for the carpet, leather sole shoes and anti-static pad or bar. Ultimately if you want the best protection for your computerized epilator place an anti-static pad and wood platform under the epilator. Attach a ground so you can easily dissipate a static charge. Static charges can and do happen to electronic equipment especially the computerized epilator. What does voltage regulator cost? A three prong line tester will cost you a couple of dollars and you can purchase a voltage line from sixty to two hundred dollars and up however remember to research before you purchase. Remember do not buy the battery backup model and look for the Underwriters Laboratories logo and seal of approval. Taking these simple precautions that will ensure the safe operation and long life of your equipment, which in turn ensures that your patient receives best possible treatment possible. Have a question about electrolysis please address it to Dear Kimberly. 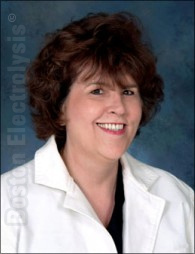 Copyrighted Boston School of Electrolysis™ 2005 all rights reserved.